I can't claim to be a girly-girl. As an adult, I never owned any pink clothing until I had a daughter of my own. I never learned to properly apply make-up, so I don't bother to wear any (unless you count Carmex as lip gloss). My hair is zero-maintenance﻿; I do own two hair dryers, but they're both so old they have to be crank-started and neither one actually produces warm air. 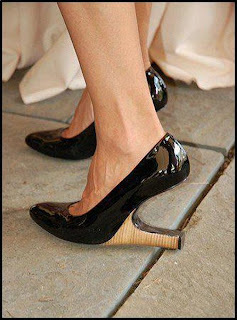 So it should come as no surprise that I do not - under any circumstances - wear high heels. In addition to the non-girly-girl thing, I'm also about 5'9" and not really interested in being any taller. I understand they're considered very feminine and supposed to make your calves look like they were sculpted out of marble, but I don't care. And if the fashion world is trying to change my mind, they're doing a terrible job. Really? 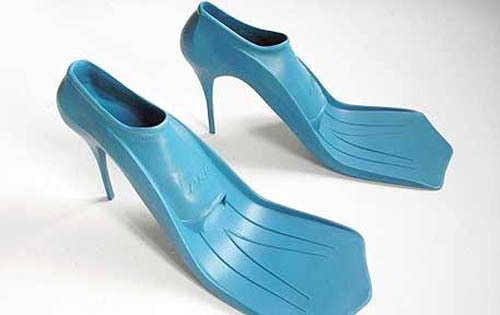 For all your fancy scuba occasions? 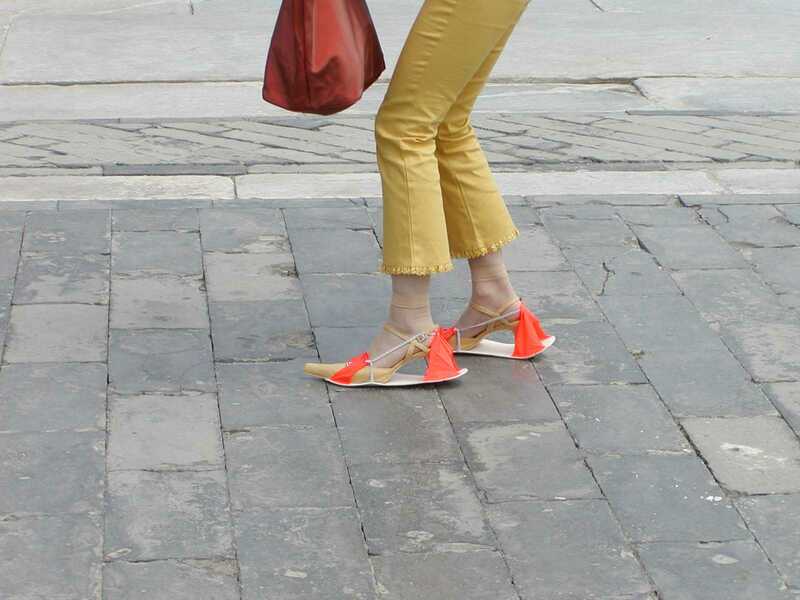 Have you ever tried walking in regular, no-heel flippers? 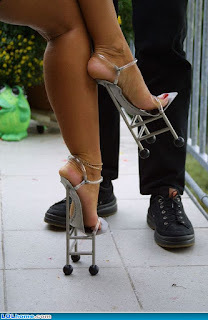 They make you look like Charlie Chaplin with a skeletal disorder. I can't imagine adding heels would contribute much in the way of elegance to that scenario. Look, I have enough trouble making these contraptions operate without stumbling headlong into the pavement. Let's not make it more complicated by trying to wear them upside-down. Nope, fail. Classic case of two wrongs not making a right. Come on. A) They're ugly. B) They appear to be partially composed of small construction cones. C) Which is ugly. D) She stole Santa's purse. E) You cannot tell me, based on the way her body is painfully stooped over in an arthritic fashion, that her feet don't feel like they're having electric shock therapy administered by knife-wielding piranhas. Oddly practical in a completely impractical way. Unfortunately I always forget my whole-person-sized umbrella when it rains, so the kids would have to huddle under my shoe-brellas as we dashed from the grocery store to the car. 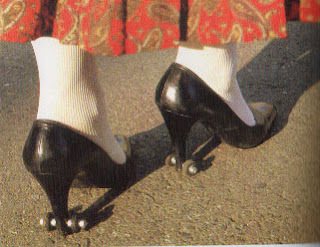 Except whoops, I forgot, you can't hurry in heels, they're built strictly for sauntering. So we're going to be quite a sight﻿ there in the Piggly Wiggly parking lot - at least as I sashay toward the car for the first three steps, at which point I'll trip over one of the kids. Linked up with Finding the Funny #8! 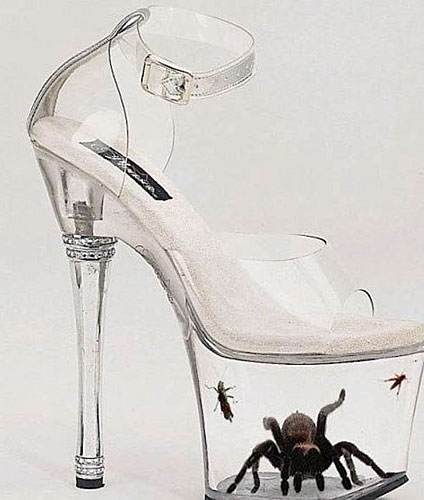 so you don't have to worry about me tripping across the stage in my high-heeled tarantula cages! oh my goodness Robyn i laughed so hard when i read this post.. you are a hoot ! i miss you ! Love these pictures! 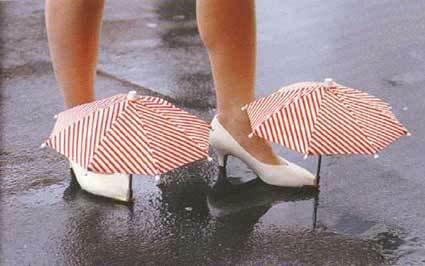 The things people do with shoes. My goodness. I can't decide which is the worst, a testament to the stunning atrociousness of them all. Nicole, I can't pick a least favorite either. I mean, I'm not as into shoes as some people, so I don't claim to be the leading authority, but I'm pretty certain they're all crimes against nature. Wow, you really got me going on this one. That shoe with the bugs is DEFINITELY two wrongs not making right. I love your thinking! 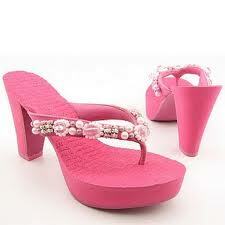 I do wear heels, but nothing like any of these. I dont' even understand how the one with the heels under the toe even works. How is she even walking???? People are so ridiculous when it comes to shoes. BUT I have an issue with flipflops.... so might not be able to be real life friends.